Persistence Market Research’s research report on “Food Fiber Market: Global Industry Analysis (2012-2016) and Forecast (2017-2022)”, provides a broad spectrum of all the aspects involved along with forecasts thus supporting to detect major revenue pockets. The market research report on global food fiber market is a comprehensive study, which focuses on the global scenario and provides actionable insights on various aspect influencing the market growth. This is done with the help of strong data and statistical analysis, to deliver an unbiased view of the market by including segments such as product type and application across the major geographies of North America, Latin America, Europe, Asia-Pacific excluding Japan (APEJ), Japan and Middle East and Africa (MEA). The gathered data helps in catching the exact rhythm of the market by putting forth a logical format, while a deep data mining ensures an all-inclusive information from various sources in the market. The research report on the global food fiber market has provided an in-depth weightage on statistics, and all figures, numbers, and graphs, are based on a perfect, and clear market understanding. This will enable the reader to take informed decisions with the help of well-furnished insights by research analysts and domain experts. The upcoming trends and developments, new innovations in products & varying product portfolios, new acquisitions, end user analysis and much more actionable acumen offer a holistic approach to the market report on food fibers ultimately providing the reader with the necessary backbone for all the strategies which he/she can plan in order to establish firm grip in a particular region or in a particular segment. The global food fiber market is segmented based on product type, application, and region. A detailed market segmentation for food fibers is highlighted below. The research report includes a chapter on competitive landscape, which covers the market shares, revenues, growth strategies applied, product portfolio analysis, distribution channels, expansion in several geographies, marketing strategies, SWOT, and pricing analysis of various key players in the global food fiber market. Such an intelligence framework can be used by readers to devise appropriate strategies in order to gain competitive advantage in the long run. Leveraging expertise in secondary research in order to get an overall market understanding and the main players involved is just one aspect. Additionally and more importantly, an extensive primary research is carried out and opinions from the key industry experts and market observers are obtained. These three aspects are coupled together to achieve maximum accuracy. The research process includes several steps which involve cross verification of data points at each step. The data thus gathered has undergone re-evaluation and re-validation with a view to remove any deviations or possible errors. This adds to the credibility of the research. The demands of consumers for food with nutritional value has escalated over past couple of years. The awareness regarding health benefits of food fibers has regulated and increased the consumption of food fibers from past few years. This is the major factor driving growth of the global food fiber market. There are several advantages of food fibers, which have a profound impact on growth of the global food fiber market. They provide health benefits such as decreased level of cholesterol, normalized movement of bowels, controlling sugar level in the body, reduced risk of heart diseases, hypertension and obesity. They improve insulin sensitivity which is beneficial for patients suffering from diabetes. Also, consumption of food fibers helps in controlling duodenal ulcer, gastrophaegal reflux disease, constipation as well as hemorrhoids. Moreover, changing lifestyle of consumers impacts eating habits, which calls for food fiber intake owing to increased awareness. This is backed up with a rise in disposable income of people worldwide, which has further triggered consumption of food fibers, contributing to growth of the global food fiber market. Food fibers are set of selected compounds which cannot be directly digested by humans, are healthy, and have several functions in day-to-day diet. They help in controlling obesity and regulate the overall functioning of the human body. Derived from fruits and plants, food fibers are advantageous to human beings with respect to physiology. It is recommended to consume a variety of foods with high fiber content to achieve huge health benefits. 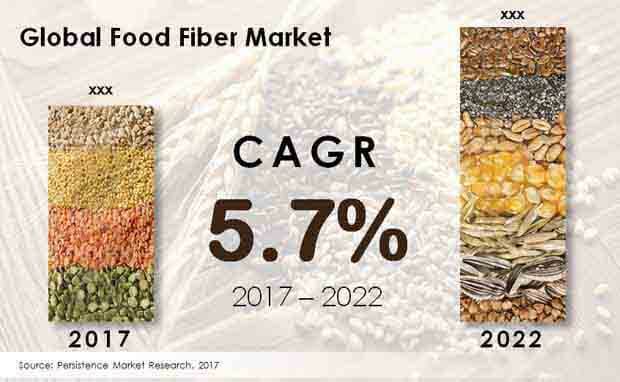 According to Persistence Market Research, the global food fiber market is expected to reach a value of about US$ 6 Bn by the end of 2022, and is poised to propagate at a robust CAGR throughout the period of forecast 2017-2022. North America is expected to remain dominant in the global food fiber market, in terms of revenues. As of 2017, North America showed high market attractiveness for food fibers, owing to high consumption. In addition, emerging economies such as Asia-Pacific excluding Japan (APEJ) is poised to grow at the highest growth rate during the period of forecast. By product type, although sales of soluble corn fiber will register a relatively lower CAGR through 2022, it is expected to dominate the global food fiber market in terms of revenues. However, this segment is expected to witness a decline in its market share over the forecast period. Inulin segment has a comparatively higher market share than all other product segments, except for the soluble corn fiber. But, sales of inulin will exhibit a healthy growth throughout the forecast period. In terms of market share, being the second highest segment, inulin can be a much lucrative option to invest into in the coming years. By application, the bakery and confectionery segment is expected to register the highest CAGR through 2022 The segment not only outruns other segments in terms of sales expansion, but is also expected to dominate the global market with a high market share by 2022 end. The research report has profiled companies which are expected to remain active in the expansion of global food fiber market throughout 2022. Companies such as Cargill Inc., Tate & Lyle, Archer-Daniels-Midland Company, Ingredion Roquette Frères S.A., SunOpta Inc., Nexira, Kerry Group, Grain Processing Corporation and J. RETTENMAIER & SÖHNE GmbH, Co KG are profiled in this research report.